This tutorial describes how to design a series of crosses to create an F1 nursery list. If you are not following the maize tutorials in sequence, restore the Maize Tutorial database (.sql) to the end of the previous tutorial, Import Germplasm Lists from Excel Files, to match database contents with current tutorial. Restoration File: Restore Maize Tutorial 2.0 (sql)? Establish the cross settings as described below and select Next. Since this is a new program and there are no saved cross settings leave the “Load from settings” box blank. Select Single Cross as a breeding method to use for all crops. If a single method is not selected for all crosses, the Breeding Management System will set the crossing method based on the breeding state of the parents. For example, if both parents are F1s the Double Cross method will be automatically chosen. Establish a naming convention for the cross. Specify the prefix, MT, for the maize tutorial cross code – usually a program code, followed by season code, 10A, representing the first season of 2010. Specify that the sequence number for the cross code should have a maximum of 3 digits for this season. The next cross code for the season is shown below for review. Set harvest date as April, 2010 and location as CIMMYT, Harrare. Save the settings as "Single cross settings" for use in subsequent crosses. 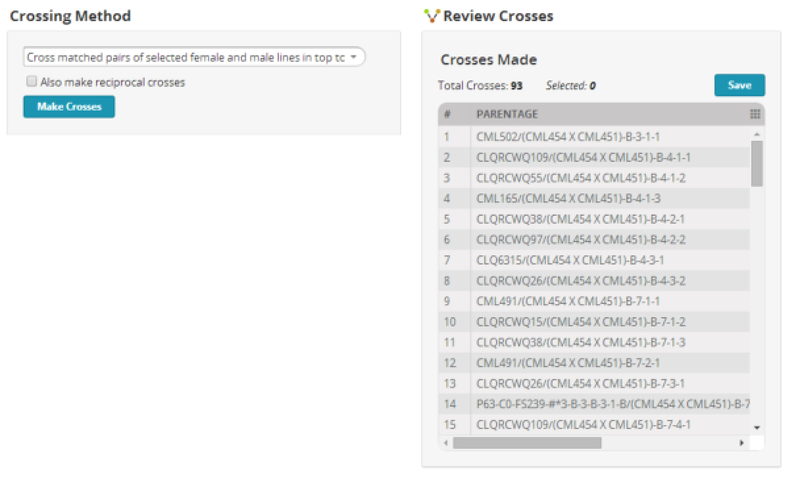 Select the female parents for the cross by browsing for the female parent list imported in the previous tutorial. Browse to the female parent list, MT2010FP, and select Add to Female Parent List. Repeat with the male parent list, MT2010MP. Select all 93 entries in both the female and male parent lists. Choose "Cross matched pairs of selected female and male lines top to bottom" for the crossing method. Select Make Crosses, review the 93 crosses, and Save. Add a new folder to the Program Lists file directory by selecting the green + icon. Name the folder, 2010 Nursery Lists, and select the green check button. Highlight the new folder and name the F1 nursery list, MT2010F1. Describe the list as MT 2010 Cross and Save. Review the file directory from the List Manager, and confirm that the F1 list is saved to the 2010 Nursery Lists folder.